Elected officials can play a key role in facilitating access to safe, affordable, nutritious food through supportive public policies. Initiatives that promote urban agriculture, protect food safety and nutrition, and improve affordability and access to healthy food are crucial to ensure an equitable and sustainable food system for all New Yorkers. 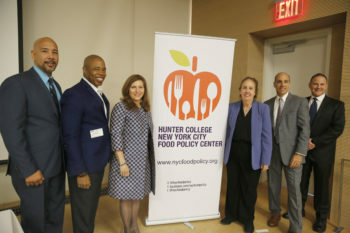 As part of the Center’s ongoing Food Policy for Breakfast series, we invited the Borough Presidents to Hunter College to join us for a discussion of food politics in their borough and across New York City. Our special guests, listed below, discussed the unique challenges of coordinating food policy, the role of nutrition education in schools, and top-down versus bottom-up approaches to policy making. If you missed the event, you can watch the recording here. The moderator, Charles Platkin, opened the session by asking the panelists to respond to the following statement: “There seem to be many interesting, smart and creative programs around food in NYC, including the first menu-labeling law, FRESH, Meatless Mondays and free breakfast and lunch for NYC public school students, but it doesn’t seem as if it is part of a master plan on food. There doesn’t seem to be any true coordination. Yes, of course, we have a food policy coordinator and the mayor’s office of food policy, but there still seems to be a lack of overall importance–a holistic, ecological program around food. It feels as though there is literally no coordination.” What do you think about this statement? Do you agree? Why isn’t there a master food plan? Policy coordination is one of the oldest challenges for governments, and it has become even more important as the problems confronting governments change. It is no different for food policy here in New York City. Eric L. Adams understands the challenges of coordination and agreed that the city’s efforts to create a healthier, more sustainable, equitable food system will take time. Brewer highlighted the lack of coordination through the example of Local Law 50. In her efforts to advance food policy, Brewer Sponsored Local Law 50 of 2011 to amend the administrative code relating to the city’s purchase of New York state food with the goal of increasing the use of locally grown and regionally processed foods in New York City as part of the Speaker’s FoodWorks Initiative. The initiative encourages (but does not mandate) City agencies including the Department of Education, the Department of Corrections, the Department of Aging, HeadStart, and others to buy from local producers in the region. “We all go to the farmers markets but the City of New York would also benefit from the fresh fruits and vegetables and so would the farmers. Unfortunately, purchasing locally is not happening the way it should,” Brewer said. For James Oddo it was less about coordination and more about individual awareness. What is the vision over the next three to five years? How do we change the outcome? Is the city empowered enough to make those changes? Is it possible to move the needle? While the panelists may have agreed that coordination is a challenge, there was a strong sense of optimism about overcoming barriers in order to create change. In Brooklyn, Adams and his administration are working with the Urban League, NAACP, ministers and leaders of different community groups to encourage citizens to adopt healthier eating within own culture. Why? Because healthy food is so much more than quinoa or kale or green juice. Food represents heritage, community and ancestry. The Bronx is partnering with the NY Bodega Association and the Supermarket Association to bring celebrity chefs to supermarkets or to Baptist Churches to introduce people to new recipes and and help them enjoy healthy food without sacrificing taste. Diaz is also working to improve health outcomes in the Bronx, which was once ranked the least healthy county in New York State, through the “#Not62” Campaign aimed at promoting social and economic factors that would help to bring about more positive health behaviors among Bronx residents. For Brewer, while the government may be empowered to make necessary changes, it needs to do a lot more. Increasing food accessibility and affordability are additional items on that to-do list. “Twenty-two supermarkets have closed in Manhattan since 2017. We need affordable supermarkets and not just Whole Check, also known as Whole Foods.” Grocery stories, which operate under a narrow 1 percent profit margin have been at risk of closure due to high commercial rent taxes. To raise awareness on the issue, In 2017, Brewer issued a report entitled “Manhattan Supermarkets: How to Keep Them Alive,” with policy recommendations to stem the tide of supermarket closures. What is the vision? What do you tell the city government? The bottom up approaches we have been discussing are critical, but how do you organize a city that has priorities and food is not one of them? Making food policy decisions is not always a simple process, and there are various approaches to creating and implementing such policies. While top-down approaches encourage behavior change through policy, bottom-up approaches attempt the opposite: to influence policy through behavior. “I know there is a desire to have a top-down visionary leadership, but the reality is that it is going to be bottom up. That is what it is going to take,” said Adams. Adams, who was diagnosed with type 2 diabetes in 2016, switched to a plant-based, whole food diet and, consequently, lost 30 pounds and reversed his diabetes diagnosis. He has used his own life experience to encourage others to be proactive about their own health and diet. 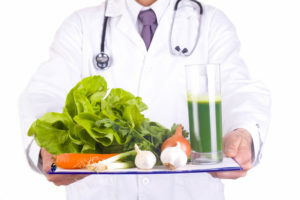 He has campaigned for funding to launch the pilot Plant-Based Lifestyle Medicine program, which includes a clinic at Bellevue Hospital to serve as a resource for adult patients with chronic disease who want to improve their health through lifestyle changes. The Bronx has succeeded in recruiting private partners to play a role in community development. “When FreshDirect wanted to move from Long Island City to the Bronx, one of the things we bargained for was to make their food available to EBT card holders,” Diaz said. Diaz also spearheaded New York State’s participation in a nationwide pilot program that allows Supplemental Nutrition Assistance Program (SNAP) participants to purchase their groceries online. Prior to this program, which is now being tested in six states, EBT card=holders could not purchase anything online. “It does comes from the top eventually, but it comes from the top when the people on the ground level kick and scream and make such a noise that the top has to begin to listen,” Oddo added. What about having food policy and nutrition education in our schools? Is that a solution to creating a bottom-up approach? Nutrition education in schools is well recognized as an important piece of the solution. However, federal policy and education curriculum mandates can slow down progress. Fortunately, the borough presidents are working to address those challenges. For Oddo, one class or semester will not create the desired (and necessary) results. Oddo has embraced a broad health and wellness agenda that includes diabetes reduction and prevention, addressing childhood obesity, advocating for a comprehensive approach to disease prevention for children K through 8th grade, launching an anti-sugary drinks campaign in grammar, middle and high schools, campaigning for increased access to healthy foods and many other initiatives. Brewer brought up a different perspective on the issue of education in schools. It was not a lack of classes but rather a lack of data on those classes. What about a wellness coordinator in each public school? Adams voiced his immediate support for a wellness coordinator in schools. Brooklyn is working to send teachers to wellness, yoga and mindfulness training programs. Earlier this month, Adams announced the launch of a pilot program to bring the practice of mindfulness, meditation and yoga to East Brooklyn schools, and eventually, to institutions across the borough. For Diaz, the importance of a wellness coordinator is rooted in the positive impact the position will have on future generations and the responsibility current leaders have to provide students with opportunities to excel. Again, if you missed the event, you can watch the recording here. 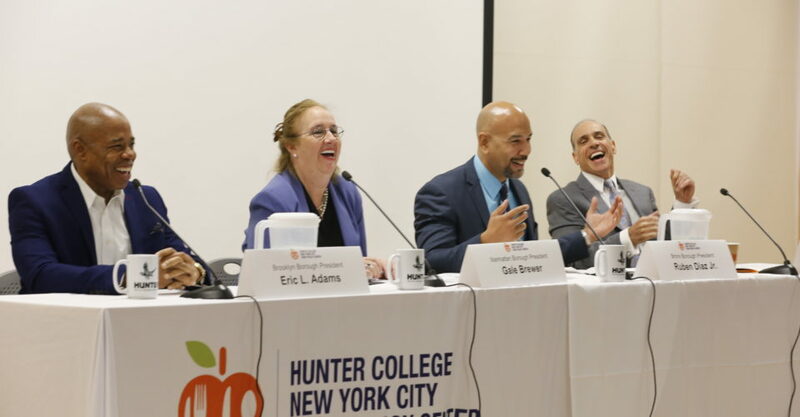 Tags: Bronx Brooklyn Brooklyn Borough President Eric Adams Events food policy Food Policy for Breakfast Gale Brewer James S. Oddo Manhattan Borough President new york city Nutrition education Queens Ruben Diaz Jr.